CPR or cardio pulmonary resuscitation is a very common and important method of first aid methodologies for saving a life if you found someone collapsed on floor unconscious. It is important to learn CPR because with only a very little effort you can save a life. Good Samaritan Law also supports the effort of saving someone’s life. Measures are now taken across the United States to train as many people as possible for administering CPR. This leads to mandatory CPR training in every schools and few states in the country have already made it compulsory. 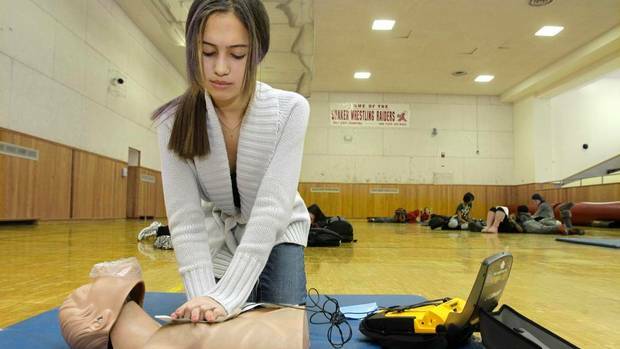 Now it’s Minnesota on its way for legislating law for compulsory CPR training in schools. What made this legislation possible is the story of a woman Jamie LaLonde who survived heart attack. Two year back she used to work at a clothing store in the Mall of America. She was about to leave for a break when she suddenly collapsed with a cardiac arrest. She told further that she caters young people on the store knew nothing what to do in such a situation. “They were all 16 to 18-years-old, and not one person around me knew what to do when I fell,” she told. Within 5 minutes a mall’s security personnel sneaked into the shop and administered CPR. EMS team arrived and shocked her twice with AED and fortunately LaLonde survived. After spending two days in coma when she opened her eyes she had a new aim of life.